Sprouts are one of the most complete and nutritional of all foods that exist. 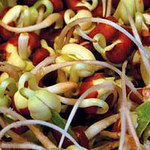 Sprouts are rich with vitamins, minerals, proteins, and enzymes. EASY-SPROUT?changes that. Now you can grow fresh sprouts (at home or away) and keep them conveniently at your fingertips. Grapefruit seed extract (GSE), also known as citrus seed extract, is a liquid derived from the seeds, pulp, and white membranes of grapefruit. Nutribiotic Liquid Concentrate contains CITRICIDAL®. CITRICIDAL is a natural quaternary compound synthesized from the seed and pulp of certified organically grown grapefruit. Can be fed dry or sprouted. Try TOP's Napoleon's Seed Mix™ by soaking them in water to give your parrot the taste of the wild! Soaked seeds are like the germinated seeds parrots would eat when living in nature. Dried seeds contain all the nutrients necessary for a plant to live and grow. When soaked, this nutrition is awakened and provides your parrot with a taste explosion. Seeds and grain in this form make the nutrition more available and easier to digest. Many small parrots, such as cockatiels, parakeets, and parrotlets, are ground feeders. That means a good amount of their daily food consists of seeds. Many of the seeds they eat in the wild are germinated. When seeds germinate (soak up/absorb humidity), they get ready to provide the necessary boost of nutrition for a plant to develop and grow. All of this nutrition is awakened when the seeds are soaked or germinated. Soak TOP's Napoleon’s Seed Mix™ and it releases this nutrition to the birds. Napoleon's Seed Mix is perfect for small hookbills and budgies who have big egos. Feed it to your bird dry or soak 8-12 hours.